The city has sent off a $7.2 million contract for an environmental impact study, bringing the long-talked about BQX one step closer to reality. Rendering courtesy of Friends of the Brooklyn Queens Connector. Mayor Bill de Blasio is signaling renewed support for the Brooklyn-Queens Connector — or the Queens-Brooklyn Connector, depending on who you talk to — by awarding a $7.2 million contract to a consulting firm to study the environmental impact of the 11-mile light rail project that would connect waterfront Brooklyn and Queens neighborhoods. Some thought the streetcar, commonly referred to as the BQX — or, again, the QBX, if you’re reading press releases from Queens Borough Hall — was dead before arrival — but the city’s move signifies a renewed commitment to seeing the project through. The plan for the BQX surfaced in 2016 as a self-financed streetcar to traverse a 16 mile path through neighborhoods along the East River, from Sunset Park in Brooklyn to Astoria. The BQX would integrate with the MTA’s fare payment and transfer system. 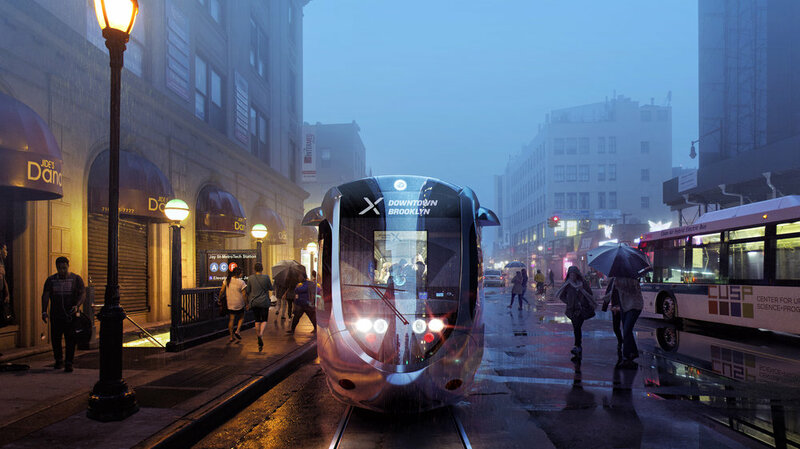 De Blasio announced in August that the BQX would need about $1 billion in federal funding for a total price tag of $2.5 billion, even after planners lopped off the five-mile span through transit-starved Sunset Park, citing worries of low ridership. “As the city grapples with a transit crisis, now is the moment for it to take control of its mass transit destiny and expand access wherever it can,” said Jessica Schumer, the executive director of the Friends of the Brooklyn Queens Connector, in a statement. “The BQX is an essential first step and will provide a model for future City-run light rail lines in transit deserts across the city." The city estimates the streetcar will be completed by the end of 2024.